IN December 2017 in this column, I rendered the nation’s sonic journey through Saida Rastam’s Rosalie and Other Love Songs (2014). In 2018, a paper was written after a study on the historiography of the national anthem, Negaraku, as well as meanings of its lyrics as a cultural symbol for nation-building. It tells about our shared belief and history. These work together, making dominant cultural and historical values as well as attitudes and beliefs a natural phenomenon. As a nation, we must come to accept common symbols, icons or memorials as representative of collective ideas and reaffirmation of the nation’s existence. In recent years, we cannot avoid experiencing a disconnect in national cohesion. The nation’s narrative is in disarray. The deschooling of the nation has in many ways affected national unity. It would be timely to remind ourselves and share Shazlin A. Hamzah’s insights in Negaraku: The National Anthem Binding Malaysian’s in Integration (Universiti Kebangsaan Malaysia Ethnic Studies Paper Series No. 59, December 2018). In her paper, the author, a research fellow at UKM’s Institute of Ethnic Studies, attempts to reveal the “eternal something”, referring to the practices, rites and ideas explaining the country that we live in. The anthem Negaraku is a national symbol much overlooked by its citizens. National symbols, she explained, can be described as modern totems as they merge the mythical sacredness of the nation into forms experienced by sight and sound, by the blending of subject and object beyond the simple representation of nations. The use of symbols and ceremonies provides national movements (for example the government), with a definite shape and force, both by projecting certain images and by enabling people to come together in ways which express the solidarity of the nation. According to Shazlin, Negaraku is the most important sonic symbol constructed by the Malaysian state in its continuous effort at nation-building. Nevertheless, together with the symbol of the monarchy, it is never free from vulnerability and is, especially in recent times, open to contestation. 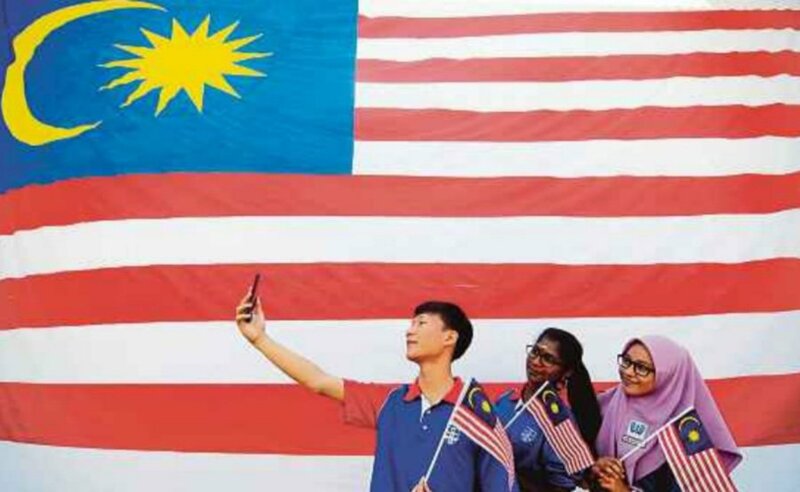 In the celebratory days of the nation, and on National Day, the national symbol in the Negaraku anthem has never promised cohesion and solidarity. In her paper, Shazlin described the French origins of the melody of Negaraku (for a dynamic international and intercultural history of the nation’s national anthem, read Saida’s Rosalie). Around the 1900, across the Malay archipelago, in what was Malaya, and the Dutch East Indies, the song was a popular hit in Malay bangsawan performances, recorded and played on gramophones. Malaya/Malaysia and Indonesia are colonial states. Before present borders were drawn, and territories defined, there was (and still is) a collective history and geography, a collective consciousness permeating in the Malay archipelago including the Philippine islands. This has to be constantly reminded in our reference and writing of the past of the states in the Malay archipelago. The melody does not stop at the border, and the language does not abruptly end to be expressed in another glossia once it moves to another territory. And there is no such a thing as violating intellectual property rights as reported in the Jakarta Globe in 2009 that Terang Bulan was “originally recorded in Indonesia.” Saiful Bahri was a Malay born on the other side of the Straits, from Payakumbuh in the Minangkabau heartlands. We have been deceived by the authority of the nation-state. The contestation whether the national anthem has national or Indonesian origins and lyrics has to end. Names such as Ismail Marzuki, Zubir Said, Tony Fonseka, Jamaluddin Alias and Alfonso Soliano have enriched the narrative of Negaraku manifesting social integration in this nation long before it was carved to be a nation-state. The national anthem must be further inculcated, as it is, through standard education and the public broadcast media. It must also be a ritualistic practice in the non-governmental and private sectors. As Shazlin emphasised, the symbols invented for this modern nation are never detached from a long and complex history of cultural borrowing and embeddedness of elements shared within the land and waters of the Malay archipelago. Despite ongoing contestations, Negaraku transcends time and remains — to this day—an iconic song accepted by all facets ofthe citizenry. The lyrics were arranged by Saiful Bahri. It must be noted that Saiful visited Malaya in 1956 for a cultural exchange programme between the two colonial states. With him were Titiek Puspa, S. Effendi, Sam Saimun and Orkes Studio Radio Djakarta. This was the time he wrote the song Semalam di Malaya and had S. Effendi sing it during the performance held at the Coliseum, Kuala Lumpur which was attended by Tunku Abdul Rahman and Tun Abdul Razak. The group toured Malaya and was at Pulau Pinang. There Saiful composed the song Mutiara Dari Pulau Pinang, sung and recorded by Sam Saimun. The spirit of the Tanah Air in the historical and cultural transcendence of the archipelago must have permeated his world view. But before I digress, we end with Saiful Bahri’s lyrics submitted to the Tunku, who saw him as a musician extraordinaire, in August 1957.